Unbeaten UCF celebrated its self-proclaimed national championship with a parade at Disney World Monday. Gov. Scott also proclaimed UCF Knights National Champions in Florida with a declaration. The Knights (13-0) finished with the only perfect season in the Football Bowl Subdivision with a Peach Bowl victory over Auburn, which during the regular season beat both Alabama and Georgia. UCF feels its accomplishment in winning the American Athletic Conference championship was undervalued by the CFP selection committee, which listed the Knights 12th in the panel’s final rankings. After beating Auburn on New Year’s Day, UCF athletic director said the Knights were declaring themselves national champions and intend to hang a championship banner at the school’s stadium. In addition, the coaching staff is going to be paid bonuses for winning the self-proclaimed title. The celebration, also featuring UCF cheerleaders and the school’s marching band, began with Sunday’s parade down Main Street, USA at Disney World. It resumes Monday night with a pep rally and free block party in downtown Orlando. 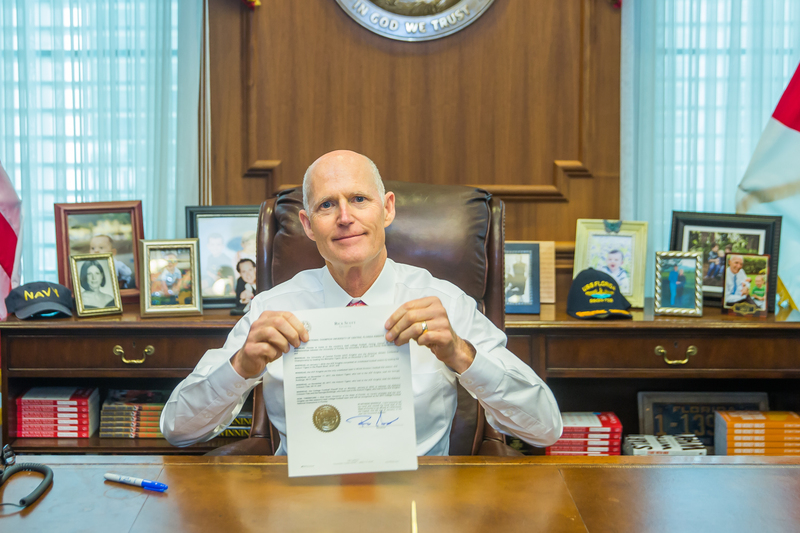 Monday, Governor Rick Scott issued a proclamation declaring the University of Central Florida Knights football team as national champions in Florida after their undefeated, 13-0 season. The UCF Knights beat the Auburn Tigers 34-27 in the Peach Bowl on New Year’s Day. This season, the Auburn Tigers beat both the Georgia Bulldogs and the Alabama Crimson Tide, who played in the last game of the College Football Playoff. To view the proclamation, click HERE.